1 Rooms are available at 12:00PM (12.00) on the day of arrival; however you are welcome to drop off any luggage in the morning. 2 Check out time is before 10:00AM (10.00) on the day of departure. 3 All bookings are subject to availability and we reserve the right to decline any booking at our discretion. 4 All Groups must have minimum one Group Leader who is responsible for the entire group. Leaders will be the contact person for our staff, and will be expected to act on all complaints. 6 Each guest will be issued swipe- or chip-cards at check-in. These cards are returned at checkout. GBP 5.00 per card will be deducted from your deposit for each missing card(s). GBP 2.00 per card will be deducted for each damaged card(s). 1 A minimum deposit of 25% of the total booking amount is required. This deposit is non-refundable and due at booking. Bank transfer and cheque payments are allowed a two-week grace period. 2 The full balance must be paid 6 weeks before your arrival date. This is to include all extras and fees. 3 Payments shall be made in such format as we may agree with you when we confirm the booking. 4 All fees incurred by the payee due to the method of payment, (e.g. bank transfer fees issued by the sending or receiving bank), are to be paid by the guest. Smart Space (UK) Limited is not responsible for these fees. 5 If any payment under these terms and conditions is overdue, then without prejudice to our other rights and remedies we may cancel your booking; and/or we may suspend the supply and/or deliveries of any other services provided to you by us. We will however inform you in writing prior to any such action. Subject to availability, you may make changes to a Group Booking up to 6 weeks prior your arrival date without charge. 2 Changes to a confirmed reservation, (e.g. changes to dates or number of guests), are subject to the availability of a suitable alternative and may be subject to change fees, if applicable. 3 We will inform you of any additional cost in writing prior to the change. No change will be made without agreement. 4 All changes shall be subject to the availability of a suitable alternative. 1 Cancellations are required to be in Writing. “Writing” may be in the form of a letter, fax or email. 3 Early departures are not eligible for refund under any circumstances. 1 At least one leader will be required to sign a statement of intention to uphold the rules set in place for groups upon arrival. 2 Group leaders are responsible for all damage caused by their actions, or the actions of those in their group, including accidental or incidental damages. Damages will be deducted from the security deposit paid, and remaining costs will be required to be paid, or a payment agreement reached prior to departure. 3 If your group’s behavior is deemed to be unacceptable, in violation of the laws of the land or causes damage to our property, your booking may be terminated without notice and you may be asked to leave our hostel premises. No whole or part refunds are given and your security deposit will be forfeit in these circumstances. We shall not be liable to you if we are prevented or delayed in the performance of any of our obligations to you if this is due to any cause beyond our reasonable control, including (without limitation): an act of God, explosion, flood, fire or accident; war or civil disturbance; strike, industrial action or stoppages of work; any form of government intervention; a third party act or omission; failure by you to give us a correct delivery address or notify us of any change of address. We shall only store and use the personal information supplied for the purposes of carrying out our contact with you and to inform you of other services and offers which we make available from time to time. This information may also be used to contact you with future offers, if available. You may opt out of this in writing at any time. 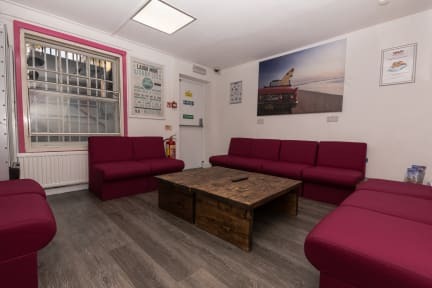 Located in the middle of Camden Town, we’re the closest hostel to Camden Markets and if you’re angling for access to all the partying and good times you could want, without compromising on security, comfort, and cleanliness, then we’re where you want to be! 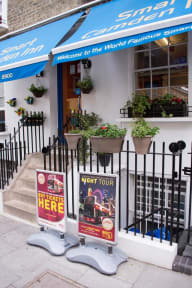 Smart Camden Inn’s superb location makes for the perfect home base while you explore London. Douches are very hot. Other things are just what you need more other luxury. Wij verbleven met 6 meiden op een kamer, wij kennen elkaar goed dus dat was geen probleem maar de kamer was echt super klein. Er was amper ruimte om je om te kleden als iedereen aanwezig was, en ruimte om je spullen neer te zetten was er al helemaal niet. Daarnaast kon je 's ochtends ook niet ontbijten, omdat het te vol was in de eetkamer en omdat de schoonmaakster in de weg stond terwijl ze aan het afwassen was, wat op dat moment totaal overbodig was. Ook was de badkamer vet klein.